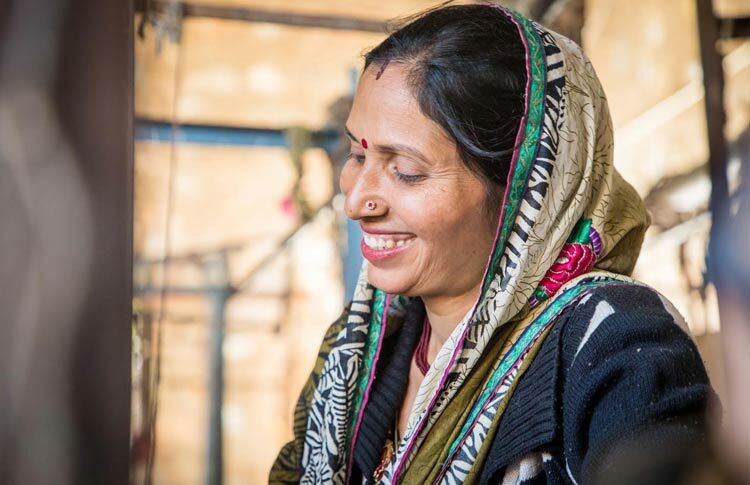 Remember, we shared with you the life story of the oldest employee of Vimla Rugs, Kesar amma, a few days ago? 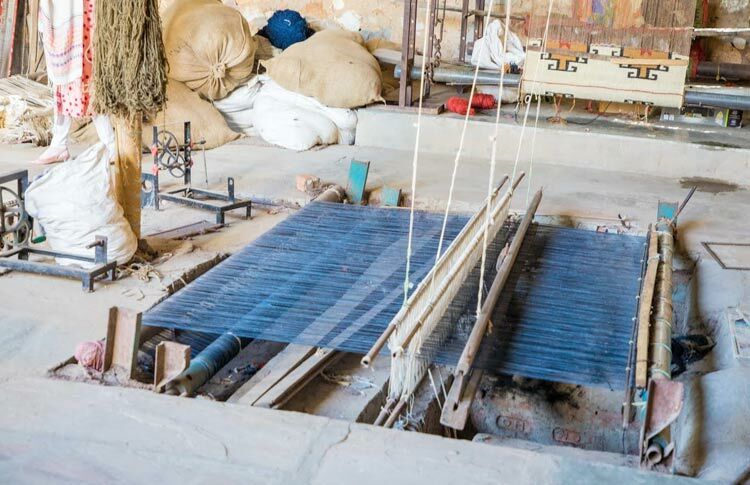 Vimla International is the factory from where our Interior Designer, Vikram, procured the exquisite hand-woven rugs for our new office, #IWBungalow! 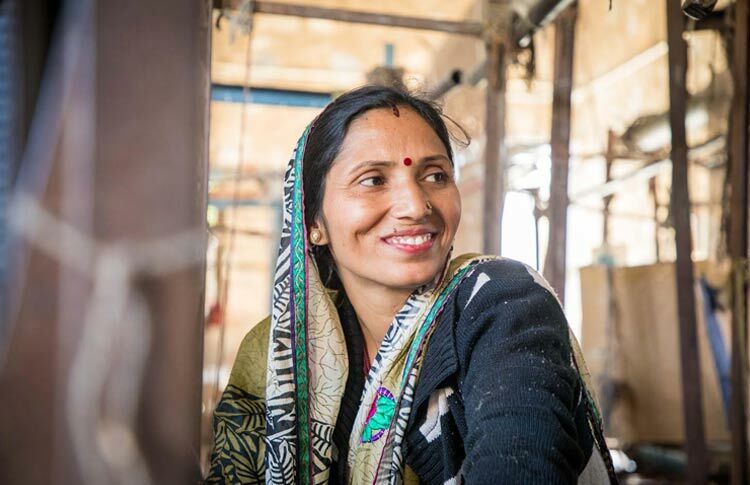 After having talked to Kesar amma, our team and I were looking around, observing women working on the standing looms (khada loom). And interestingly, the sight of the hall flooded with colourful rugs reminded me of the time I overheard Vikram sharing with someone the reason why Sutra Designs chose to buy rugs from here. A little more wandering around and randomly chatting with the women-at-work, a few members of our team decided to give ‘tana-bana’ a hand. Speaking of which, we hear this phrase a lot, don’t we, tana-bana? But do you know what it means? 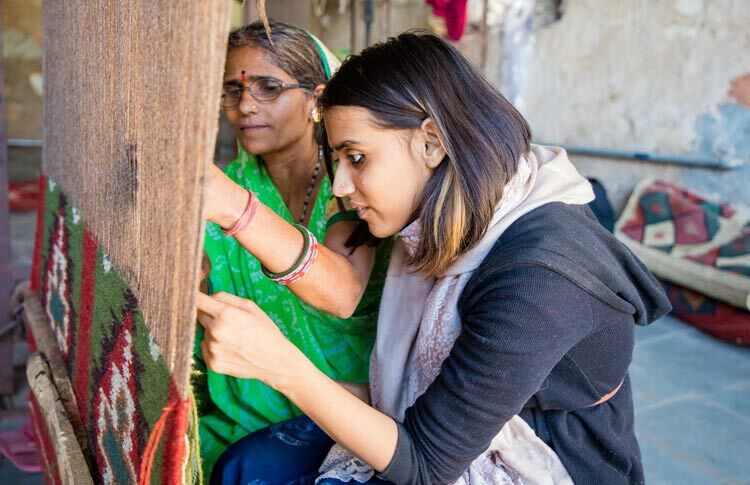 ‘Tana’ is the thread that is weaved on ‘Bana’, which is the thicker thread (jute/silk/cotton) tied around the loom stand, and hence the name tana-bana. Would you introduce me to this technique you’re working on here? 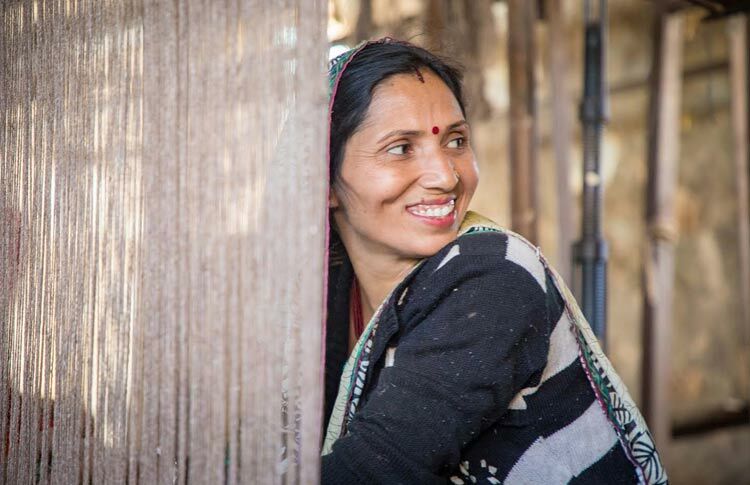 Smiling shyly, she told me, I’m weaving a rug on this stand using the technique of Khada Loom. 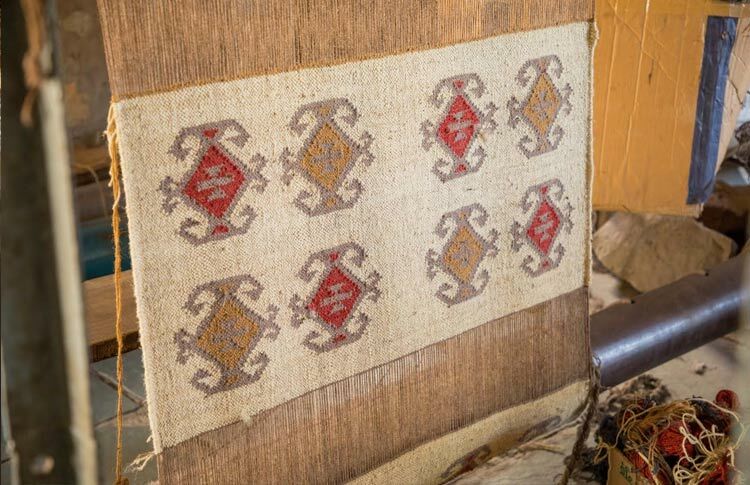 It is a jute rug that we weave following the ‘tana-bana’ pattern. How long have you been working at Vimla International? I joined here some 10 years ago. I am from this village itself (Banskho), so when I got to know that they employ women also, I thought of giving it a try and came to meet the owners. Okay, and did they provide you with training? Yes, they trained us in the beginning, and it took me about five to six months to learn this one technique. I like this work, you don’t realize when the time flies. We work here 9-5, and around 1pm take lunch, which I carry with myself, as do most others. 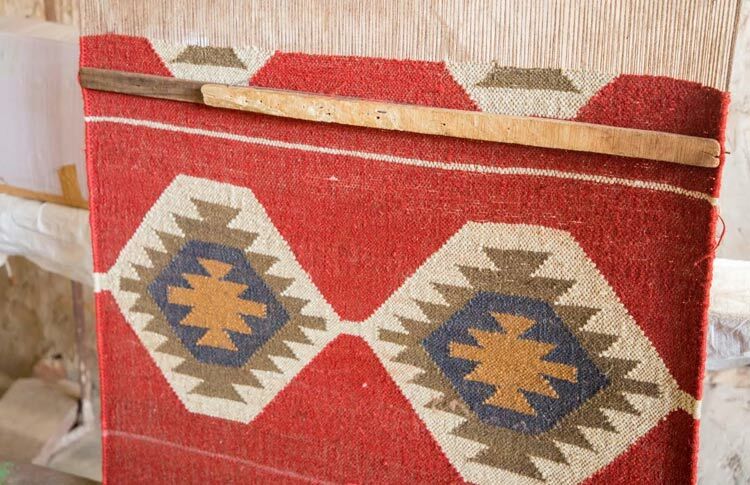 This rug that you’re working on, how much time will this take you? This is just a 21-inch rug, so this will get completed in five to six hours. 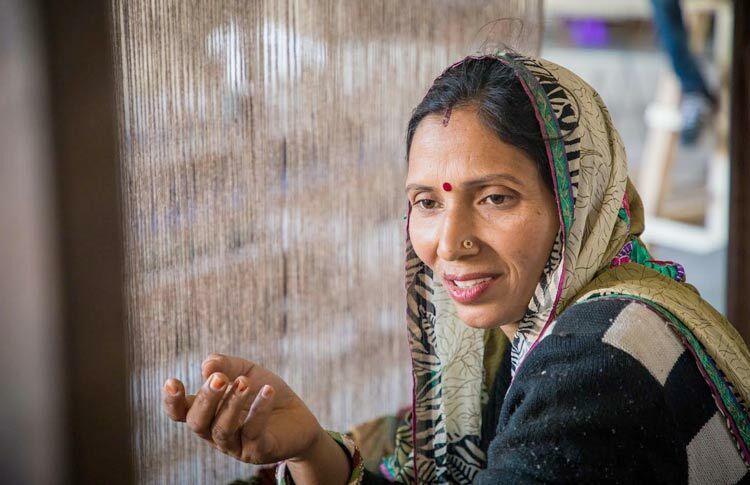 It is the big ones that take two to three days to be weaved and depending on the size, sometimes even more. And what did you do before you joined here, Santara Ji? I used to do threading work on Khadi Charkha at home. I do that now also, sometimes when I get time after going from here. But it depends, there is housework, and sometimes the family just sits to watch TV, she admitted, smiling. Ha-ha, that’s nice. Who all are there in your family? My husband and four children. My daughters have now grown up, aged 20 and 17, one is studying at Maharani College, Jaipur, and the other is coaching for SSC. The boys are younger and are still in school. My husband runs a small shop (kirana store), so he also stays out of home all day, but since the kids have grown up, I don’t have to worry about them, they take care of each other. Aha, speaks the concerned mother. What change has this job brought in your life? A lot, she exclaimed. If you earn, you don’t have to ask for money from your husband, you can meet your small wishes and demands with your own money. When you don’t earn, you can sometimes feel hesitant in asking repeatedly. And not just on ‘wants and desires’, this job also helped me contribute to our needs, like in the house expenditure, she proudly shared. That’s great. How do you receive your salary? The administration here has got our bank accounts opened, and the salary cheque gets deposited in it directly. It is comfortable that way. Have you also encouraged other women in your community to work and learn this skill? 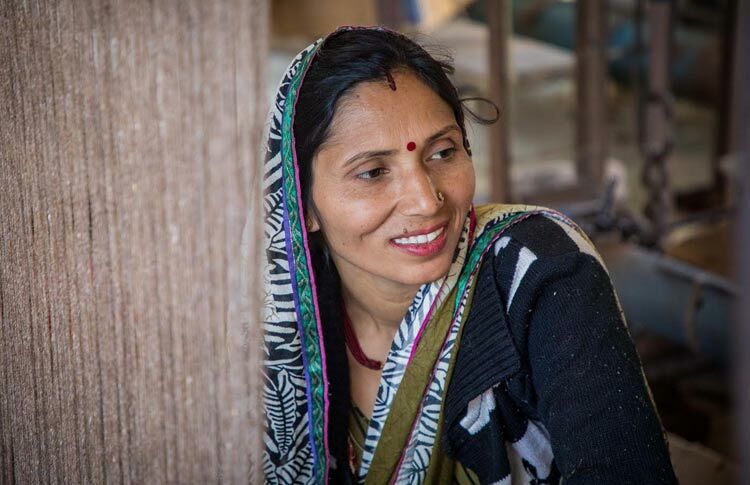 Most of us here are from the same village, so a large number of women are already working. But everyone’s situation differs, if someone’s family doesn’t support them to work, we may try and help them, but there are also women who themselves don’t want to work. On this note, what future do you see for your daughters? Right now they’re studying and all I want for them is a good future. I hope they study well, and get good jobs, before we start thinking about their marriages, which is not happening anytime soon. That’s all parents can do, provide children with the facilities, rest all depends on their efforts and destiny. That’s so good to hear, Santara Ji. And as we wrapped our conversation, the other women also began to get up from their respective benches, a sign for us to excuse them for lunch, oops. They were sweet enough to ask us to join them. 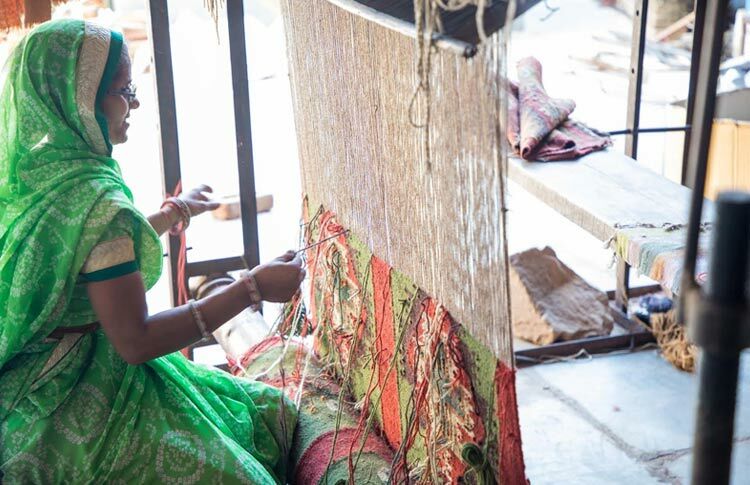 Such are the talented and wonderful artisans of Vimla Rugs! So off they went with their lunch boxes, but you don’t go anywhere, because next in order, we will be weaving together the different steps of Rug Making for you – be around!